How Many Photos Have You Untagged Today? I had written this in June 2007 so I was 13. It was only a month or two after I had first got Facebook and it made me think about how many photos have I untagged since then but only after leaving an equally disgusted comment. How many photos have YOU untagged of yourself? Now, I can’t find most of these photos. NOW, I’d rather have the bad photo than the lack of photos from my childhood. The overriding thing I see when I look at this is not what I look like but the memories of being with my first ever best friend @readingbook93 who I live across the world from now. In honour of finding this photo, I’ve compiled a bunch of photos that I’ve untagged over the years for a range of reasons from double chins to “looking fat” to simply having my eyes closed to just not liking what I looked like at all. This is just me growing up in various stages of puberty yet I was so unkind to myself, publicly declaring to the world how ugly I was. These photos haven’t changed, I have though and I wish I could hug each version of me in these photos and tell her how utterly adorable she was. The 2nd photo was taken before my 1st social. (I went to an all girls school and socials were mixers where you met boys). I felt so beautiful wearing makeup for the 1st time + picking out my favourite top… until I saw this photo and felt ugly in comparison to my friends. How can 1 photo drastically how you feel about yourself in the moment? 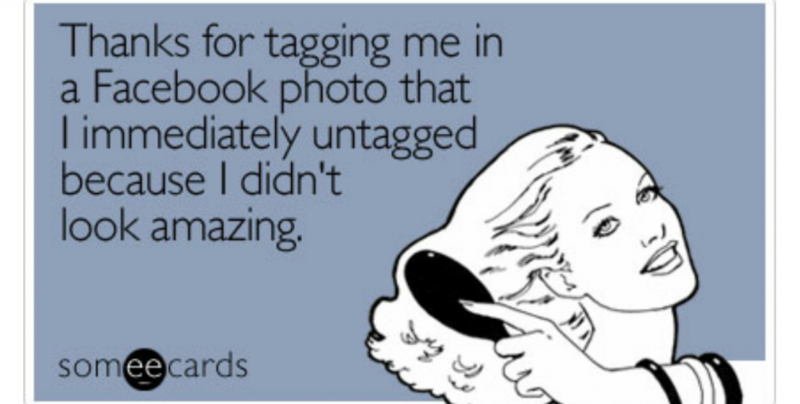 Stop untagging photos and more importantly, stop abusing that girl in your photos. Newsflash: she is you. And no matter the age or the angle, she deserves love just as much as the dolled up version of you. Accept yourself at all angles. Accept your appearance, you don’t have to love the photo but stop using such harsh words like “gross” and “disgusting”, the same words we would use to describe trash or vomit, to describe ourselves.